perusal scripts, demo CDs, piano/vocal scores, band parts and backing tracks. These are recorded by me with a few friends, but hopefully you'll see the potential and be inspired to do better! The music on the demos is also available without the vocals as backing tracks for use in performances. Please contact Samuel French Ltd for backing tracks. They can also supply piano/vocal scores and band parts. Some sound advice on using live music or backing tracks! 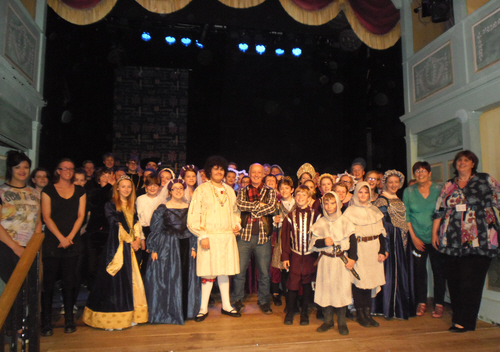 Henry had both his 100th and 101st productions in Nov 2004! The life of King Henry VIII - England's most outrageous monarch is accurately related in this rock and roll musical which has been performed by amateurs, schools and semi-pro groups, throughout the U.K. and also in such far off places as New Zealand, Zimbabwe, Saudi Arabia and Kenya. Although a real challenge for youngsters of this age (12-14) it gave them all opportunities to develop their talents in many different ways. Age range: Suitable for any large varied group. Scenery: A basic stage set on which odd props/ furniture are quickly brought or struck to suggest locations as needed. Music: Songs vary from serious rockers to cool swingers. Backing tracks available, also vocal score, piano/vocal score, optional extra band parts for drums, bass, guitar and 2nd keyboard. Listen to FULL DEMOS of all the songs! Running time: (for the full show): Act 1= 60 mins - Act 2 = 55 mins. The Coronation Finale - ALL except Henry who's dead. A basic vocal score (melody line and chords). They will also let you borrow a perusal script and demo CD. Nell performed by Alyth Musical Society, Perthshire - April/May 2004. The 1660's was an amazing time to be alive. As well as the plague and the great fire of London, there was the opening of Drury Lane Theatre where a bunch of hopeful girls hoped to find an escape from life in the nearby bawdy house. Find out how their outrageous antics lead to the love story of Charles II and his girlfriend Nell Gwyn - and how they went on to re-shape history. Following Nell's hilarious debut in Hexham in March 2001, the show has been produced all over the UK and abroad including France, Canada, Poland and Australia. The show was especially written to give lots of good roles for women, and it includes plenty of comedy and lively rock songs. Charles and Nell's Belles (Nell is wearing the glasses!) 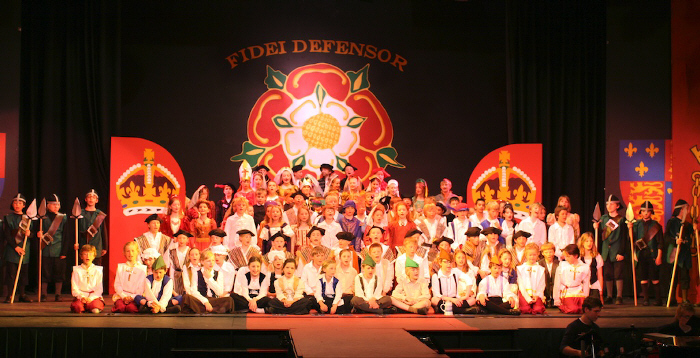 from the first production by Hexham Junior Youth Theatre 30/3/2001. Casting: Over 35 speaking parts including Nell and her singing group of friends ("Nell's Belles") which features her pickpocket sister, the telepathic twins, the fortune teller. There's also Nell's drunken mother, King Charles and his wife and all his "official" mistresses, his scheming brother James and loads more including a whole army of charladies. Lots of chorus work. Many doubles/triples possible. (Minimum cast about 12). Age range: Suitable for any large varied group although a few small edits may be appropriate if under 10's are involved. Scenery: A basic stage set with two doors which fulfil a variety of roles including tavern entrances, bedroom doors, bathing huts, stage exits etc. Extra props (including a blue sea cloth for the beach scene) and furniture are quickly brought or struck to suggest locations as needed. Music: 16 songs (including reprises) mainly dance/rock numbers but also a couple of slow swings and ballads. Most songs are scored with lead and backing vocals. Backing tracks available, also piano/vocal score and optional extra band parts for drums, bass, guitar, sax. Running time: Act 1 = 55 mins - Act 2 = 50 mins. CLICK HERE if you'd like a large JPEG of this book cover design to use for your posters or programmes. Many doubles are possible. (Minimum cast about 12). Nell's Belles was written for companies who have more female performers than males. However the balance can easily be changed by having men play some of all of the charladies. Listen to FULL DEMOS of all the songs here! Additional band parts for guitar, bass, drums and saxaphone (Eb). Nov 2002: MERCEDES COLLEGE, SOUTH AUSTRALIA ended their FAWKES production outdoors with a full firework finale - WOW! It's cabaret time down at Catesby's! Following "HENRY's" success, "Fawkes" tells the story of the 1605 gunpowder plot. Most people will know how a gang tried to blow up the Houses of Parliament, and how Guy Fawkes was caught. Following days of ghastly interrogation the gang were all rounded up and executed. Actually, the plot was far more sinister than that and makes for a thrilling whodunnit involving spies, sabotage and someone being walled up alive! The show is set in Catesby's Cabaret Club with the outrageous hostess Miss Catherine Wheel. Even if the club didn't exist, everything in it did actually happen right up to the explosive finale! Casting: About 40 speaking parts ranging from the creepy to the utterly camp. Characters include the desperate conspirators, good-time show girls, the dashing Lord Mounteagle and his childhood sweetheart Dorothy, the strange King James and his groom of the bedchamber, the devilishly cunning Sir Robert Cecil, three tough old women and a dummy! Lots of chorus work but many doubles possible. (Minimum cast about 18). Age range: Suitable for any large group, although a few small edits may be appropriate if under 10's are involved. Scenery: A basic stage set represents the Cabaret Club in which other scenes are created with simple lighting changes and extra props/ furniture when required. Music: 12 major numbers, mostly suitable for grand showpieces with dancers, singers, effects and strong narrative content. Backing tracks available, also piano/vocal score, optional band parts for drums, bass, guitar, trumpet, sax/clarinet and trombone. Running time: Act 1 = 60 mins - Act 2 = 50 mins. Many doubles are possible. (Minimum cast about 18). traditional Guy Fawkes dummy, but this is optional. In several productions Catherine Wheel has been played by a man in drag. A CRACKING SCRIPT FOR SCHOOL PRODUCTIONS! We have just finished staging Fawkes - The Quiet Guy and I just wanted to tell you how much we enjoyed the whole experience... a really fun mixture of memorable characters, 'cheesy' dialogue and moving moments (when Dorothy was bricked up there wasn't a dry eye in the house). "Nothing" is a fabulous song in my view, but the head of music favours "A Thousand Angry Men". The students really enjoyed bringing history to life in this way, in the 400th year since the gunpowder plot. All in all, a cracking script for school productions! Ian Evans, Head of Drama, The Corbet School, Baschurch, Shrewsbury. Additional band parts for guitar, bass, drums, trumpet, saxaphone/clarinet and trombone (supplied in both C and Bb). "So it's a fairy story, but this baby sure ain't no pantomime..."
Love, laughs, songs and participation make this into a perfect pantomime alternative for all the family which has enjoyed success with both professional and amateur casts. We recently performed CATS and also WE WILL ROCK YOU, OUR HOUSE and HAIRSPRAY as part of our repertoire, but for most of the committee our favourite remains RUMPELSTILTSKIN ! Casting: 11 speaking parts (most of which can be male or female) including the star struck Prof Miller, his strong willed daughter Miranda, the terribly nice King, the scheming Madam Inquisitor, a variety of mercenary hacks and Rumpelstiltskin - the utterly evil changeling creature. Also a variety of chorus roles including extra hacks, guards, villagers, phantoms etc.. Doubles possible. (Minimum cast 8). Age range: Full family entertainment. Main Scenes: (Most of these can be achieved by a few props and lights!) Fairground, Palace interior, Palace Vaults, King's Bedroom, a Turret room, a park bench, the catacombs. Music: About 12 fairly easy songs including reprises. Backing tracks available, also piano/vocal score, optional band parts for drums, bass, guitar. Running time: Act 1 = 50 mins - Act 2 = 50 mins. Plus lots of chorus parts including villagers, messengers, guards, palace servants, crows, demons, enchanted toys and the hacks of the Daily Slur. Note: The Professor and the King are male, Miranda and the Inquisitor are female. All other parts can be played by anyone. For smaller companies: the Baker, Manikin and Smudge can be played by one person. The Town Crier can be a voice off. BATS Next Generation production in Basingstoke June 2006. 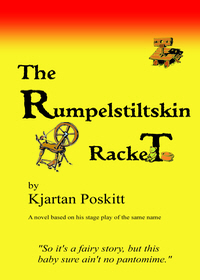 You can now download and read my adaption of The Rumpelstiltskin Racket as a novel on Kindle! Additional band parts for guitar, bass and drums. "A marvellous marvellous show, full of life, laughter, colour and surprise. There was not a person in the audience who was not joining in." Sammy moves into an old house along with his lively mum and inventor dad. Almost immediately he is aware of spooky goings on, but only his school friend Alice believes him. Why won't Compost the gardener let him look round? Who leaves messages in his homework book, who owns the mysterious doll that keeps appearing, is the birthday cake really poisoned, what is nasty Miss Nettle's secret and why does the sundial chime at midnight? An all-year pantomime show with slapstick, music, mad jokes and a songsheet. Casting: 6 main speaking parts (3m 3f) and some chorus characters as further school kids and ghosts. (Minimum cast 10). Main scenes: The house living room, the magic garden. There are also other scenes such as street exterior, the kitchen and Sammy's bedroom which can be achieved by a few props and lights. Music: About 10 fairly easy songs including reprises. Backing tracks available, also piano/vocal score, optional band parts for drums, bass, guitar. Running time: Act 1 = 50 mins - Act 2 = 45 mins. Plus a chorus of more schoolfriends and enchanted flower-children. Note: Sammy can be male or female and Alice can be "Eddie" if required! I'm Not Scared - Sammy, Alice and AUDIENCE! 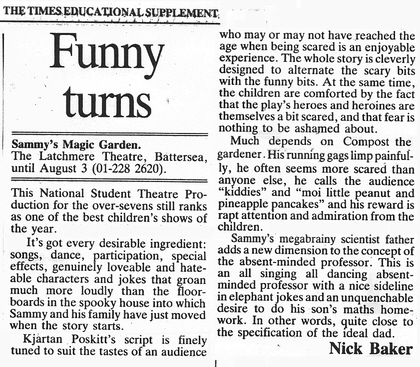 Latchmere Theatre production 1987 featuring Ivan Kaye as Compost. They will also let you borrow a perusal script. Don't forget that that all shows and music are available from Samuel French (London) Ltd.